They say the third time's the charm. Well the third FuMPFest convention tried to kill Storm. 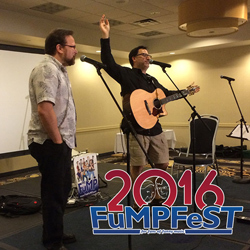 Get the full story right here on this compilation of recordings from FuMPFest 2016! All of the artists who performed at FuMPFest 2016 gave us permission to include their songs on this compilation which is being used to raise funds for the convention. So whether you were there and want to relive the fun, or you missed it and want to get a taste of what happened, this compilation is an awesome cross-section of what went on at FuMPFest 2016. We've got new songs from Worm Quartet, old songs from Luke Ski and Hot Waffles, and an improvised song from Paul and Storm. We've got several of the entries into this year's Dumb Parody Ideas contest, plus Carrie Dahlby performing will a full choir. And, of course, we've got several selections from Paul and Storm's amazing Guest of Honor concert, where storm performed with a broken thumb and swollen knee, having fallen down a flight of stairs earlier in the day. It truly was a once-in-a-lifetime concert, and we got it all on digital tape! This 2-CD set contains 60 tracks and roughly 2.5 hours of music and comedy. Pick up your copy today! The physical CD comes with instant access to the digital download as well.